The purpose of this post is to determine whether basketball teams who choose to employ an offensive strategy that involves predominantly shooting three point shots is stable and optimal. We employ a game-theoretical approach using techniques from dynamical systems theory to show that taking more three point shots to a point where an offensive strategy is dependent on predominantly shooting threes is not necessarily optimal, and depends on a combination of payoff constraints, where one can establish conditions via the global stability of equilibrium points in addition to Nash equilibria where a predominant two-point offensive strategy would be optimal as well. We perform a detailed fixed-points analysis to establish the local stability of a given offensive strategy. We finally prove the existence of Nash equilibria via global stability techniques via the monotonicity principle. We believe that this work demonstrates that the concept that teams should attempt more three-point shots because a three-point shot is worth more than a two-point shot is therefore, a highly ambiguous statement. From Eq. (11), we immediately notice some things of importance. First, we are able to deduce just from the form of the equation what the invariant sets are. We note that for a dynamical system with flow , if we define a function such that , where , then, the subsets of defined by , and are invariant sets of the flow . Applying this notion to Eq. (11), one immediately sees that , , and are invariant sets of the corresponding flow. Further, there also exists a symmetry such that , which implies that without loss of generality, we can restrict our attention to . With respect to a stability analysis of , we note the following. The point is a: • Local sink if: , • Source if: , • Saddle: if: , or . What this last calculation shows is that the condition  which always corresponds to the point , which corresponds to a dominant 3-point strategy always exists as a saddle point! That is, there will NEVER be a league that dominantly adopts a three-point strategy, at best, some teams will go towards a 3-point strategy, and others will not irrespective of what the analytics people say. This also shows that a team's basketball strategy really should depend on its respective payoffs, and not current "trends". This behaviour is displayed in the following plot. Note the saddle point (x1,x2) = (0,1). This clearly shows that all NBA teams will never adopt a dominant 3-point strategy, as it is always more optimal to play to maximize payoffs. Therefore, destabilizes the system at . Similarly, destabilizes the system at . 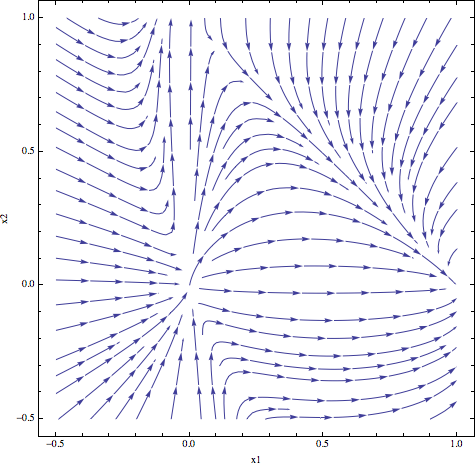 Therefore, bifurcations of the system occur on the lines and in the four-dimensional parameter space. That is, the payoff to a team using strategy in a league with profile is proportional to the probability of this team using strategy . We therefore see that a team’s optimal strategy would be that for which they could maximize their payoff, that is, for which is a maximum, while keeping in mind the strategy of the other team, hence, the existence of Nash equilibria. Hopefully, this work also shows that the concept that teams should attempt more three-point shots because a three-point shot is worth more than a two-point shot is a highly ambiguous statement. In actuality, one needs to analyze what offensive strategy is optimal which is constrained by a particular set of payoffs. where is the thermal diffusivity and is material dependent. Note also, we are considering the one-dimensional case for simplicity. where are constants determined by appropriate boundary conditions. We can see that as , ! That is, that even under an infinite propagation speed (greater than the speed of light), the solution to the heat equation remains bounded. PDE folks will also say that solutions to the heat equation have characteristics that propagate at an infinite speed. Thus, the heat equation is fundamentally acausal, indeed, all such distribution propagations from Brownian motions to simple diffusions are fundamentally acausal, and violate relativity theory. Some efforts have been made, and it is still an active area of mathematical physics research to form a relativistic heat conduction theory, see here, for more information. That is, all solutions to the wave equation travel at the speed of light, i.e., ! Therefore, wave equations are fundamentally causal, and all dynamical laws of nature, must be given in terms of hyperbolic partial differential equations, as to be consistent with Relativity theory. Continuing the debate of the value of three-point shooting in today’s NBA, my article analyzing this issue from a mathematical perspective has now been published on the arXiv, check it out! The purpose of this post is to demonstrate some very beautiful (I think!) mathematics that arises form Darwinian evolutionary theory. It is a real shame that most courses and discussions dealing with evolution never introduce any type of mathematical formalism which is very strange, since at the most fundamental levels, evolution must also be governed by quantum mechanics and electromagnetism, from which chemistry and biochemistry arise via top-down and bottom-up causation. See this article by George Ellis for more on the role of top-down causation in the universe and the hierarchy of physical matter. Indeed, my personal belief is that if some biologists and evolutionary biologists like Dawkins, Coyne, and others took the time to explain evolution with some modicum of mathematical formalism to properly describe the underlying mechanics instead of using it as an opportunity to attack religious people, the world would be a much better place, and the dialogue between science and religion would be much more smooth and intelligible. In this post today, I will describe some formalism behind the phenomena of prebiotic evolution. It turns out that there has been a very good book by Claudius Gros and understanding evolution as a complex dynamical system (dynamical systems theory is my main area of research), and the interested reader should check out his book for more details on what follows below. where are the concentrations of molecules, is the autocatalytic self-replication rate, and are mutation rates. that is, this quick calculation shows that the total concentration remains constant. which is the number of surviving species. Clearly, this is non-zero for a finite catalytic rate . This shows the formation of a hypercycle of molecules/quasispecies. These computations clearly should be taken with a grain of salt. As pointed out in several sources, hypercycles describe closed systems, but, life exists in an open system driven by an energy flux. But, the interesting thing is, despite this, the very last calculation shows that there is clear division between molecules which can be considered as a type of primordial life-form separated by these molecules belonging to the environment. Nowadays, one cannot watch a popular science tv show, read a popular science book, take an astrophysics class without hearing about black holes. The problem is that very few people discuss this topic appropriately. This is further evidenced that these same people also claim that the universe’s expansion is governed by the Friedmann equation as applied to a Friedmann-Lemaitre-Robertson-Walker (FLRW) universe. Any solution of Einstein’s vacuum equations which is spherically symmetric in some open set V is locally equivalent to part of the maximally extended Schwarzschild solution in V.
The concept of a black hole then occurs because of the singularity that occurs in this metric. The point is that one cannot have it both ways! One cannot claim on one hand that black holes exist in the universe, while also claiming that the universe is FLRW! Since, by Birkhoff’s theorem, external to the black hole source must be a spherically symmetric and static spacetime, for which a FLRW is not static nor asymptotically flat, because of a lack of global timelike Killing vector. I therefore believe that models of the universe that incorporate both black holes and large-scale spatial homogeneity and isotropy should be much more widely introduced and discussed in the mainstream cosmology community. One such example are the Swiss-Cheese universe models. These models assume a FLRW spacetime with patches “cut out” in such a way to allow for Schwarzschild solutions to simultaneously exist. Swiss-Cheese universes actually have a tremendous amount of explanatory power. One of the mysteries of current cosmology is the origin of the existence of dark energy. The beautiful thing about Swiss-Cheese universes is that one is not required to postulate the existence of hypothetical dark energy to account for the accelerated expansion of the universe. This interesting article from New Scientist from a few years ago explains some of this. Also, the original Swiss-Cheese universe model in its simplest foundational form was actually proposed by Einstein and Strauss in 1945. If black holes exist, then by Birkhoff’s theorem, the spacetime external to the black hole source must be spherically symmetric and static, and cannot represent our universe. Perhaps, a more viable model for our universe is then a spatially inhomogeneous universe on the level of Lemaitre-Tolman-Bondi, Swiss-Cheese, the set of cosmologies, etc… The advantage of these models, particular in the case of Swiss-Cheese universes is that one does not need to postulate a hypothetical dark energy to explain the accelerated expansion of the universe, this naturally comes out out of such models. One also has evolution equations for the Weyl curvature tensors and , these can be found in Ellis’ Cargese Lectures. 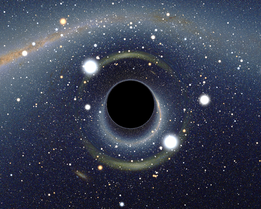 Despite the fact that these modifications are absolutely necessary if one is to take seriously the notion that our universe has black holes in it, most astronomers and indeed most astrophysics courses continue to use the simpler versions assuming that the universe is spatially homogeneous and isotropic, which contradicts by definition the notion of black holes existing in our universe. While the Warriors have certainly embodied some of these philosophies, my personal opinion is that D’Antoni’s style of play can only be vindicated if there is a clear trend in championship teams that reflect these philosophies. As I show below, this is simply not the case. 1. There is very little that championship teams have in common! 2. The overwhelming thing that they do have in common is that 14 of the last 15 NBA champions have all been ranked in the Top 10 for Defensive Rating, something that Mike D’Antoni’s coaching philosophy has never really included throughout his years in Phoenix, New York, and Los Angeles. 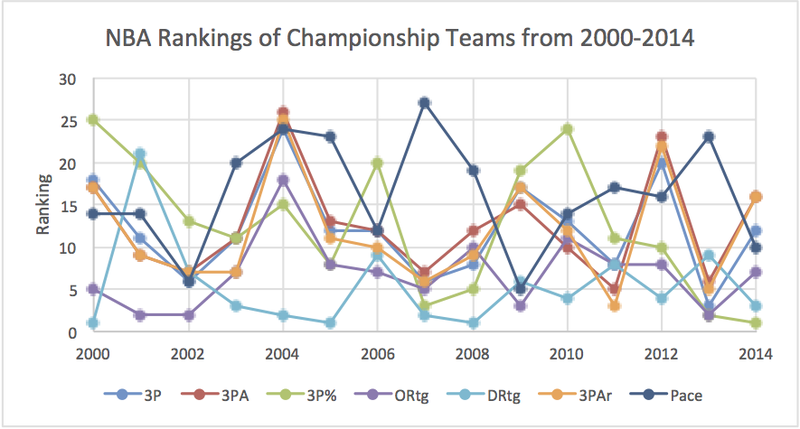 This, I believe is the grand point that no one seems to be interested in making, perhaps, because according to the “mainstream”, defensive-oriented basketball, which, by definition is “less-flashy” still is the overwhelming common characteristic amongst championship-winning teams. Perhaps, the Warriors will win this year, but as I said above, I do not believe that one year is anywhere near enough to establish a trend and a vindication of D’Antoni’s basketball philosophies. The NBA finals are exactly five days away, and I wanted to present an analysis breaking down the matchup between The Golden State Warriors and Cleveland Cavaliers. I used machine and statistical learning techniques to generate the most probable scenarios for the outcome of each game, and this is what I found. Note that the probabilities listed above are not the probabilities for a team to win a specific game, they are the probabilities of a specific scenario occurring. Also, multiple scenarios can occur in a single game, so the probability of multiple scenarios occurring would be the sum of the individual ones. Thoughts so far: Despite GSW being down right now 2-1, I still believe that Cleveland’s wins were statistical anomalies. Cleveland’s Game 2 and Game 3 wins according to our model only had 1.07%, 9.34%, and 1.765% chances of occurring in this series. Whereas, the GSW Game 1 win had a 44% chance of occurring in this series. 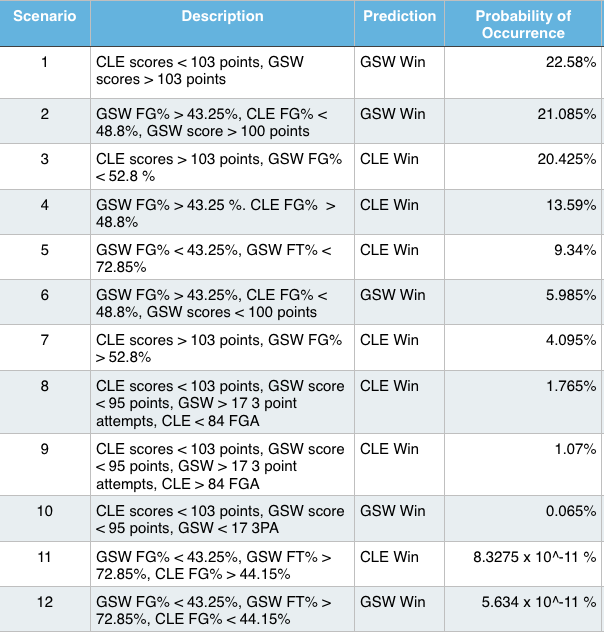 Thoughts: All of GSW wins have been the dominant scenarios in this series, i.e., Outcomes 1 and 2. All of CLE wins in this series have been statistical anomalies/outliers. This pattern continued in Game 5. Another GSW win through the dominant scenarios in the series, as expected.